Located right on the beach overlooking the Mediterranean Sea, Eftalia Splash Resort Hotel is a luxury accommodation just a short drive from Avsallar and Konaklı. With a private beach area, a huge outdoor pool, water lounges and a fun water park featuring water slides, this beachfront hotel is ideal for those looking for a fun and relaxing holiday. The guestrooms are decorated with modern furnishings and there are six restaurants serving a wide range of local and International cuisines. Perfect for families and couples alike, the hotel offers a numerous water sports amenities such as surfing, jet skiing or parasailing, outdoor sports activities, fun park, entertainment programmes for the young ones, live music and night shows. There’s also a spa and wellness area with facilities such as Turkish Bath, sauna, Jacuzzi and rejuvenating massages. Eftalia Splash Resort Hotel is located right on the edge of the beach, only a 5-minute walk (500 metres) from the sea. The hotel is 18km from the resort of Alanya, known for its pretty beaches of sand pebbles. The town centre of Avsallar and Konaklı are also in the vicinity, just 5km from the hotel. The hotel can be accessed from two airports – the Gazipaşa Airport is 60km away and the Antalya Airport – 90km from the hotel. Eftalia Splash Resort consists of one five-storey building surrounded by lush gardens and pools. The building houses 290 spacious rooms, all decorated with modern furnishings. The guestrooms are categorised into Standard Rooms and Family Rooms. The Standard Rooms feature one double bed, one single bed and a sofa bed, while the Family Rooms come with two double beds, two single beds and a sofa bed. Common amenities across all rooms include balcony, fully equipped bathroom, air conditioning, telephone, LCD TV, mini bar and safe deposit box. Dining options are aplenty at Eftalia Splash Resort Hotel, housing one main restaurant and five a la carte restaurants serving a range of local and International cuisines. 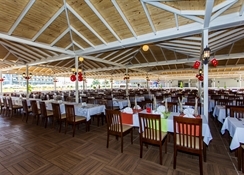 The main restaurant’s breakfast, lunch and dinner buffets offer fresh seafood and local dishes, while the restaurants on the beach serve Italian, Ottoman, Asian and grilled dishes. Guests need to make reservation for the a la carte restaurants a day before. You can also enjoy selected alcoholic and non-alcoholic beverages free of charge between 10am and 11pm. The lobby bar is open 24 hours where you can get refreshing drinks and snacks. Children are in for a treat at Eftalia Splash Resort Hotel, Alanya that offers a fun water park for kids of all age groups. 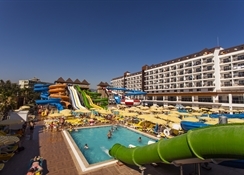 It has an octopus, pirate boat and tropical tower suitable for 2-6 year olds; rafting, kamikaze and twister water slides for kids between the ages of 7-10 years; boomerang and bowl water slides for our children of 14 years and above. 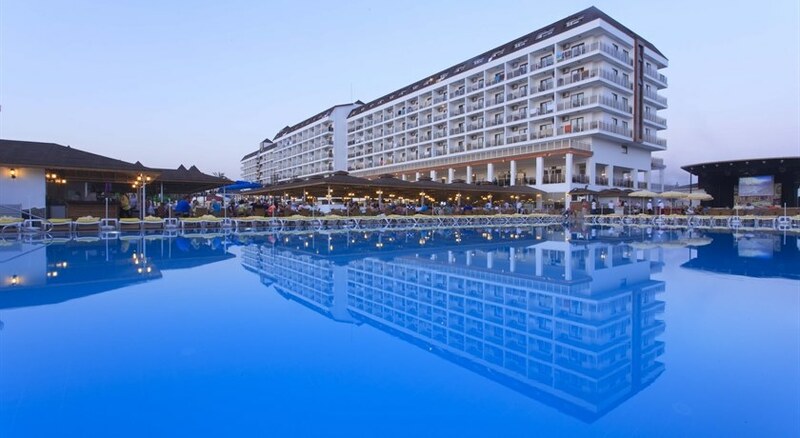 The aqua park also has the hotel’s main swimming pool, children’s pools and water lounges for both children and adults. The hotel provides playgrounds and facilities for basketball, football, tennis, table tennis and beach volleyball. Guests can also try different water activities such as surfing, jet skiing, catamaran cruise, parasailing, sea bike and canoeing. The spa and wellness area offers Turkish Bath, sauna, Jacuzzi, steam room and massage services. The hotel’s private beach area comes with facilities like lounge, umbrellas and towels. Entertainment events are organised all day long in the resort and on the coast. There are also entertainment programs for children, live music and night shows on offer. Great holiday. All areas clean an tidy . Staff helpfully. Pools brilliant.rooms adequate.